After Omega Centauri, 47 Tucanae is the brightest globular cluster in the night sky. 47 Tucanae, 47 Tuc (or NGC 104) is a globular cluster located in the constellation Tucana. It is about 4.0 ± 0.35 kpc (13,000 ± 1,100 ly) away from Earth, and 120 light years across. 47 Tuc can be seen with the naked eye, with an apparent magnitude of 4.1. It appears about 50 arcminutes across. Due to its far southern location, 18° from the south celestial pole, it was not catalogued by European astronomers until the 1750s, when the cluster was first identified by Nicolas-Louis de Lacaille from South Africa. 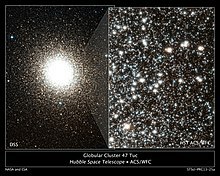 47 Tucanae is the second brightest globular cluster after Omega Centauri, and telescopically reveals about ten thousand stars, many appearing within a small dense central core. The cluster may contain an intermediate-mass black hole. The cluster was given its Bayer designation ξ Tucanae in Johann Bayer's Uranometria (1603). It was recorded as a cluster in 1751-2 by Nicolas-Louis de Lacaille, who initially thought it was the nucleus of a bright comet. Lacaille then listed it as "Lac I-1", the first object listed in his deep-sky catalogue. Its designated number "47" was assigned in Allgemeine Beschreibung und Nachweisung der Gestirne nebst Verzeichniss ("General description and verification of the stars and indexes"), compiled by Johann Elert Bode and published in Berlin in 1801. Bode did not observe this cluster himself, but had reordered Lacaille's catalogued stars by constellation in order of Right Ascension. 47 Tucanae is the second brightest globular cluster in the sky (after Omega Centauri), and is noted for having a small very bright and dense core. It is one of the most massive globular clusters in the Galaxy, containing millions of stars. The cluster appears roughly the size of the full moon in the sky under ideal conditions. Though it appears adjacent to the Small Magellanic Cloud, the latter is some 60.6 ± 1.0 kpc (200,000 ± 3,300 ly) distant, being over fifteen times farther than 47 Tuc. The core of 47 Tuc was the subject of a major survey for planets, using the Hubble Space Telescope to look for partial eclipses of stars by their planets. No planets were found, though ten to fifteen were expected based on the rate of planet discoveries around stars near the Sun. This indicates that planets are relatively rare in globular clusters. A later ground-based survey in the uncrowded outer regions of the cluster also failed to detect planets when several were expected. This strongly indicates that the low metallicity of the environment, rather than the crowding, is responsible. 47 Tucanae contains at least two stellar populations of stars, of different ages or metallicities. The dense core contains a number of exotic stars of scientific interest, including at least 21 blue stragglers. Globular clusters efficiently sort stars by mass, with the most massive stars falling to the center. 47 Tucanae contains hundreds of X-ray sources, including stars with enhanced chromospheric activity due to their presence in binary star systems, cataclysmic variable stars containing white dwarfs accreting from companion stars, and low-mass X-ray binaries containing neutron stars that are not currently accreting, but can be observed by the X-rays emitted from the hot surface of the neutron star. 47 Tucanae has 25 known millisecond pulsars, the second largest population of pulsars in any globular cluster. These pulsars are thought to be spun up by the accretion of material from binary companion stars, in a previous X-ray binary phase. The companion of one pulsar in 47 Tucanae, 47 Tuc W, seems to still be transferring mass towards the neutron star, indicating that this system is completing a transition from being an accreting low-mass X-ray binary to a millisecond pulsar. X-ray emission has been individually detected from most millisecond pulsars in 47 Tucanae with the Chandra X-ray Observatory, likely emission from the neutron star surface, and gamma-ray emission has been detected with the Fermi Gamma-ray Space Telescope from its millisecond pulsar population (making 47 Tucanae the first globular cluster to be detected in gamma-rays). It is not yet clear whether 47 Tucanae hosts a central black hole. Hubble Space Telescope data constrain the mass of any possible black hole at the cluster's center to be less than approximately 1,500 solar masses. However, in February, 2017, astronomers announced that a black hole of some 2,200 solar masses may be located in the cluster; the researchers detected the black hole's signature from the motions and distributions of pulsars in the cluster. However, a recent analysis of an updated and more extensive timing data set on these pulsars provides no solid evidence in favor of the existence of a black hole. In December 2008, Ragbir Bhathal of the University of Western Sydney claimed the detection of a strong laser-like signal from the direction of 47 Tucanae. In May 2015, the first evidence of the process of mass segregation in this globular cluster was announced. The cluster's Hertzsprung–Russell diagram suggests stars approximately 13 billion years old, which is unusually old. ^ "Retirement in the suburbs". Retrieved 12 June 2015. ^ Shapley, Harlow; Sawyer, Helen B. (August 1927). "A Classification of Globular Clusters". Harvard College Observatory Bulletin. 849 (849): 11–14. Bibcode:1927BHarO.849...11S. ^ a b c d e "NGC 104". SIMBAD. Centre de données astronomiques de Strasbourg. Retrieved 2006-11-17. ^ Carretta, E.; et al. (2000). "Distances, Ages, and Epoch of Formation of Globular Clusters". The Astrophysical Journal. 533 (1): 215–235. arXiv:astro-ph/9902086. Bibcode:2000ApJ...533..215C. doi:10.1086/308629. ^ Marks, Michael; Kroupa, Pavel (August 2010), "Initial conditions for globular clusters and assembly of the old globular cluster population of the Milky Way", Monthly Notices of the Royal Astronomical Society, 406 (3): 2000–2012, arXiv:1004.2255, Bibcode:2010MNRAS.406.2000M, doi:10.1111/j.1365-2966.2010.16813.x. Mass is from MPD on Table 1. ^ a b Forbes, Duncan A.; Bridges, Terry (May 2010), "Accreted versus in situ Milky Way globular clusters", Monthly Notices of the Royal Astronomical Society, 404 (3): 1203–1214, arXiv:1001.4289, Bibcode:2010MNRAS.404.1203F, doi:10.1111/j.1365-2966.2010.16373.x. ^ a b McLaughlin, D.E. ; et al. (2006). "Hubble Space Telescope Proper Motions and Stellar Dynamics in the Core of the Globular Cluster 47 Tucanae". Astrophysical Journal Supplement Series. 166 (1): 249–297. arXiv:astro-ph/0607597. Bibcode:2006ApJS..166..249M. doi:10.1086/505692. ^ "47 Tuc: A Great Globular Cluster of Stars". Astronomy Picture of the Day. August 26, 2008. Retrieved 25 May 2017. ^ a b Kızıltan, Bülent; Baumgardt, Holger; Loeb, Abraham (2017). "An intermediate-mass black hole in the centre of the globular cluster 47 Tucanae". Nature. 542 (7640): 203–205. arXiv:1702.02149. Bibcode:2017Natur.542..203K. doi:10.1038/nature21361. PMID 28179649. ^ a b Freire, Paulo; Ridolfi, Alessandro; Kramer, Michael (2017). "Long-term observations of the pulsars in 47 Tucanae - II. Proper motions, accelerations and jerks". Monthly Notices of the Royal Astronomical Society. 471 (7640): 857–876. arXiv:1706.04908. Bibcode:2017MNRAS.471..857F. doi:10.1093/mnras/stx1533. ^ O'Meara, Stephen James (2013). Deep-Sky Companions: Southern Gems. Cambridge, United Kingdom: Cambridge University Press. pp. 16–17. Bibcode:2013dcsg.book.....O. ISBN 978-1-107-01501-2. ^ Hilditch, R. W.; Howarth, I. D.; Harries, T. J. (2005). "Forty eclipsing binaries in the Small Magellanic Cloud: fundamental parameters and Cloud distance". Monthly Notices of the Royal Astronomical Society. 357 (1): 304–324. arXiv:astro-ph/0411672. Bibcode:2005MNRAS.357..304H. doi:10.1111/j.1365-2966.2005.08653.x. ^ "A Shortage of Planets". Archived from the original on 2010-08-20. Retrieved 16 November 2010. ^ Anderson, J; Piotto, G; King, I. R; Bedin, L. R; Guhathakurta, P (2009). "Mixed Populations in Globular Clusters: Et Tu, 47 Tuc?". The Astrophysical Journal Letters. 697 (1): L58. arXiv:0904.1626. Bibcode:2009ApJ...697L..58A. doi:10.1088/0004-637X/697/1/L58. ^ "NASA's Hubble Space Telescope Finds "Blue Straggler" Stars in the Core of a Globular Cluster". Hubble News Desk. 1991-07-24. Retrieved 5 May 2006. ^ Bryner, Jeanna. "Mass Migration: How Stars Move in Crowd". Retrieved 14 November 2010. ^ Grindlay, Jonathan E.; Heinke, Craig O.; Edmonds, Peter D.; Murray, Steve S. (2001). "High-Resolution X-ray Imaging of a Globular Cluster Core: Compact Binaries in 47 Tuc". Science. 292 (5525): 2290–2295. arXiv:astro-ph/0105528. Bibcode:2001Sci...292.2290G. CiteSeerX 10.1.1.315.4370. doi:10.1126/science.1061135. PMID 11358997. ^ "The 25 millisecond radio pulsars in 47 Tucanae". ^ "Pulsars in Globular Clusters". ^ Bogdanov, Slavko; Grindlay, Jonathan E.; van den Berg, Maureen (2005). "An X-Ray Variable Millisecond Pulsar in the Globular Cluster 47 Tucanae: Closing the Link to Low-Mass X-Ray Binaries". Astrophysical Journal. 630 (2): 1029–1036. arXiv:astro-ph/0506031. Bibcode:2005ApJ...630.1029B. doi:10.1086/432249. ^ Bogdanov, Slavko; Grindlay, Jonathan E.; Heinke, Craig O.; Camilo, Fernando; Freire, Paulo C. C.; Becker, Werner (2006). "Chandra X-Ray Observations of 19 Millisecond Pulsars in the Globular Cluster 47 Tucanae". Astrophysical Journal. 646 (2): 1104–1115. arXiv:astro-ph/0604318. Bibcode:2006ApJ...646.1104B. doi:10.1086/505133. ^ Abdo, A. A.; et al. (2009). "Detection of High-Energy Gamma-Ray Emission from the Globular Cluster 47 Tucanae with Fermi". Science. 325 (5942): 845–848. Bibcode:2009Sci...325..845A. doi:10.1126/science.1177023. PMID 19679807. ^ "The Australian Optical SETI Project" (PDF). ^ "Hubble Catches Stellar Exodus in Action". Space Daily. 18 May 2015. ^ "The Astrophysics Spectator: The Hertzsprung-Russell Diagrams of Star Clusters". www.astrophysicsspectator.org. Retrieved 2019-02-16. Wikimedia Commons has media related to 47 Tucanae. Nemiroff, R.; Bonnell, J., eds. (7 November 1998). "Globular Cluster 47 Tucanae". Astronomy Picture of the Day. NASA. This page was last edited on 2 April 2019, at 07:19 (UTC).